I expect as soon as I play with one with a few nice apps that appeal to me, I’ll buy one. My wife is a Mac hater like you, but for different reasons, and she is thinking of getting one. There is a lot to be said for the cheapest model, which is what I will likely get too, assuming it doesn’t turn into £550 by the time they announce it. Why would you never buy a Mac? Is it Price?! Quality?! Speed?! Operating System?! …? ps: don’t forget to get HE Discount, which should be available online or in the Apple Stores. I only mention this as you don’t buy much from Apple. On the otherhand Archos are releasing their android tablet soon for £150 which Id want to check out before I decide. I suppose the beauty of android is that they’re like buses… they all arrive at the same time, so one is bound to meet my requirements, whereas apple only have the one device. Maybe you should spend the extra money on paying more for better coffee. @sander I’m a Linux man through and through and that is unlikely to ever change. I do think that Macs are overpriced but I also dislike Apple’s general control-freak tendencies. For a device like the iPad it won’t bother me too much but in a laptop…..it would drive me crazy. @John Suddenly I am unsure of myself. Is ‘Apple is evil’ correct in the UK or have I made a grammatical faux pas? Any references? Composite things like companies are plural in English and singular in American English. So your usage is fine. I suppose it has a pdf viewer, does it also have djvu, doc, xls, ppt viewers? I believe the price of ipads (like the iphones) in europe will be higher than the states. @GG No idea if it supports the other formats. Does it matter though? Just export them to pdf on another machine – job done. @GG just looked at my files in my dropbox account via my iPhone: I can view all the MS Office documents fine. I’m not sure what djvu is though. So, assuming it is true that if it works on the iPhone it will work on the iPad, we should be fine. I know tons of geeks –even Linux geeks– that have Macs, particularly Macbooks. I bet there are a million people who came through a UNIX (or more recently Linux) culture that have Macbooks. “I would never buy a Mac, not in a million years” is separate. Linux users bash Mac/Windows users. Mac users bash Linux/Windows users. So, when a Mac user and I are engaging in a little verbal sparring over a pint or two we usually put aside our differences and go for Windows instead :) Maybe I’m mellowing in my old age though because I quite like Windows 7! You are right – many Linux users have gone the way of the Mac recently. I’ll never be one of them though (at least, not with my OWN money). It’s so damn beautiful you could hang it on the wall of your living room as a frame. When it will have multitasking capabilities, thanks to blutooth/wifi, it could be used as a universal home controller, control/set/see house temperatures, turn on-off devices/lights, listen to music etc! @GG I know what you mean – so much nicer than all of the cheap and nasty digital photo frames on offer and more useful too. If I had enough money, I’d buy several to dot around the house. Apologies for the out of context: I think I misread or mis-parsed your original (as you point out). I too quite like Windows 7: what is the world coming to? @Mike Why do you like windows 7? they basically only changed the taskbar…Everything is pretty much the same (compared to vista) ?! @Sander I never used Vista since it was a bit crappy – always stuck to XP for those times that I had to use Windows. Windows 7 is Vista ‘done right’ as far as I am concerned. We may have the interesting situation on launch in the UK that the iBook store is not ready — I think they have said “to come” in UK — but that you can download Kindle for the iPhone (assuming all such apps still work on the iPad, etc etc), and get all your books from Amazon rather than Apple. 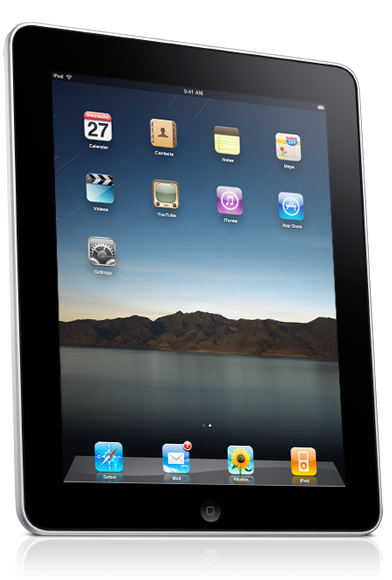 You might want to hang fire for a year or two while Apple works out the kinks from the iPad. I was amazed that iPhone didn’t have a search facility for all documents and data across until quite some time had passed after the initial release. This was a feature of the original Newton, so it wasn’t as if they had to conceive the idea for the first time. For me a lot will hinge on the new productivity apps and PIMs being developed for it. It will be interesting to see if the iPhone versions successfully scale to the new screen real estate. By successfully, I mean how they take advantage of the additional real estate available to them, add greater value. It will be interesting to see how people find the whole ergonomic experience of inputing bulk text on the iPad. Being flat, I wonder about whether there will be added neck and shoulder strain from leaning over the iPad while it’s on a flat surface. Not everyone is going to carry the dock around with them. This wouldn’t quite be the same problem if they supported HWR in some way. Then one hand could hold the iPad and the other could write with a pen. Maybe somebody’s going to come up with a one-handed (chorded?) keyboard so that you can type just as quickly as a two-handed typist, but with the other hand supporting the iPad. People have tried it with hardboards but not AFAIK on softboards. I’m looking forward you put some comments on the Google Nexus One. Mike, I’m the exact opposite of you: I’m an Apple diehard and absolutely swear by my Macbook Pro (work), iMac (home), and iPod Touch (everywhere)… but I’ve been a skeptic about the iPad from day 1. My main issue is that I prefer the small form factor of the iPod Touch and the iPad didn’t seem to provide anything I didn’t already have that would offset the larger size. But… now, the more I see these iPads and hear about them, the more I’m thinking I want one too, for “trivial computing” as you coined it. That would be gaming, light office-oriented work, photos and video, and web browsing — especially on the go, or when I’m traveling to a conference or on vacation with the wife and kids. With more and more services moving from Flash to HTML5 the iPad is beginning to make more sense. I’m more likely to wait until the second generation comes around, but you never know.